Maritime security technology company, Sonardyne International Ltd, has demonstrated the capabilities of its Navigation and Obstacle Avoidance Sonar, NOAS, during three days of water borne demonstrations in Plymouth, south-west England. More than 25 equipment specifiers, owners’ representatives and vessel operators from the European superyacht industry, commercial shipping and naval community attended the event in late November to witness first-hand the capabilities of NOAS as an important new aid to vessel navigation and underwater obstacle avoidance. 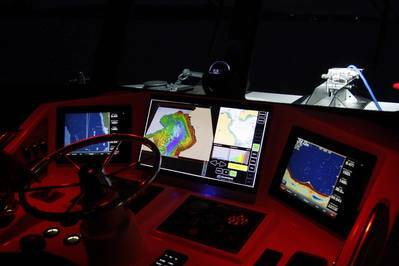 Above the water, innovations such as ECDIS (Electronic Chart Display and Information System) which integrates GPS, AIS and radar, have delivered valuable improvements in situational awareness for captains and their crews. However, when navigating poorly charted or unfamiliar areas, commercial ships, expedition cruise ships and naval vessels remain vulnerable to groundings and collisions with submerged objects. In their quest for privacy, large private yachts are particularly at risk as owners seek to explore remote locations, often close to shore. This is where underwater forward-looking sonar technology provides a solution. NOAS works by scanning a wide area in front of a vessel with multiple sonar ‘pings’ to create a highly detailed, 3D model of the sea floor and water column along a vessel’s course. The intuitive display informs the crew of water depth, underwater features and potential hazards to a range of up to 600 metres over a 90 degree field of view. NOAS also has a sonar mode for navigation and underwater intruder detection capability out to a range of 1,500 metres over a 180 degree field of view. For the demonstrations, NOAS was operated from Sonardyne’s sea trials and research vessel, Echo Explorer, illustrating the ease with which the system can be retro-fitted to existing vessels as well as new vessels. During each trip around the Tamar estuary and Plymouth Sound, the system’s hull-mounted sonar and processor located on the vessel’s bridge, generated real-time 3D images. These were overlaid on digital navigation charts, offering those on board with a highly immersive view of the underwater environment. Alerts based on water depth, distance from the vessel and estimated time to impact were created to demonstrate how NOAS warns operators of potential collision hazards or shallow water. With NOAS, sonar imagery over a wide field of view is temporarily retained, providing the operator with a recent history of the vessel’s passage. This feature is expected to be of particular value when manoeuvring large vessels as the depth of the water and potential hazards can be confirmed even when outside of the sonar’s current field of view.